I had arrived from Yerevan by minivan in Tbilisi after a 6 hour drive through the mountains. The minivan dropped me off at the main bus station. There were several money changers at the station, after changing money, 1 USD = 2.46085 GEL Georgian Lari in October 2017. I went to talk to a cab driver to take me to my hostel, the cab driver said 6 Lari, I smiled and said to myself another cheap travel destination. After checking into my hostel, I got few tips from the helpful staff and was off to explore the city by foot. Some of the best places to visit in Tbilisi include the old city and charming old houses. The area between Freedom Square, Meydan, and Baratashvili Bridge contains several gems and is always in good shape. Also, Sioni Church, the old Synagogue and the lively Chardeni Area with restaurants and bars are great places to visit as well. With all the travelling and walking I had done that day, the excitement of the new city kept me going and I wasn't tired, but my camera battery died and I headed back to the hostel. Back in the hostel travelers were sharing their fun experiences, someone offered me a glass of wine, I am not much of a drinker , I thanked them and accepted the wine. Tbilisi has a high and long wine-making tradition. In fact, it dates back 7000 years. But Georgia is still a newcomer to the international wine scene. Nevertheless, you will find several varieties of indigenous grapes grown here. Thus, when visiting Tbilisi do not hesitate to sample some authentic Georgian wines, which are made by small wineries and are very rare to find in North America. If you are looking for some decent wine bars, you can start at the Kote Afkhazi Street, which goes all the way through the Old Town. Kote Afkhazi Street is a beautiful walk by itself. 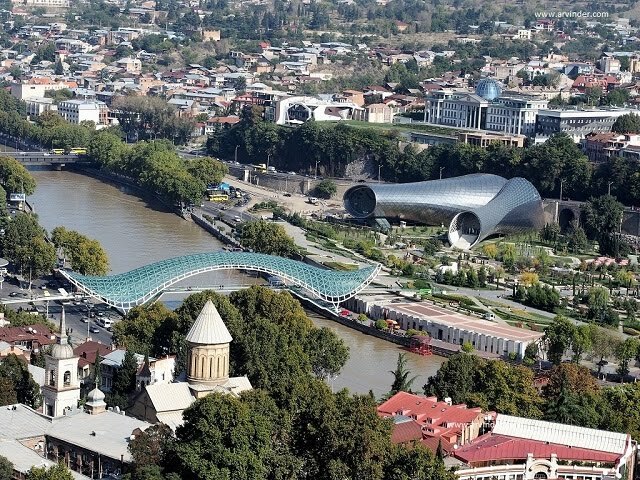 Out of the 3 cities I visited in the Caucasus, Yerevan, Baku and Tbilisi. My favorite was Tbilisi. 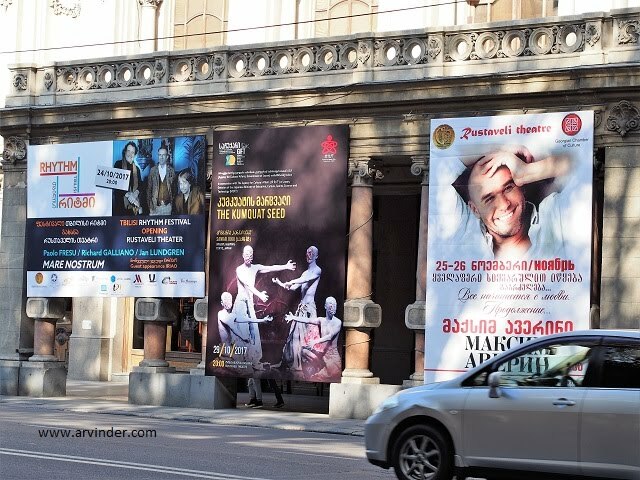 From the nice smiling people, the arts, the culture, theater, ballet, cinema and great cuisine, Tbilisi has it all. Poet and writers like Rustaveli are from Georgia,there is a whole street named after him, with Rustaveli Theater on that street, I waked that street several times during my 3 days as my Hotel was 10 minutes away. Bridge of Peace below Picture, Its a pedestrian bridge over a river Kura. Walk the bridge, its a tourist thing to do. Below: The sulfur springs gave Tbilisi its name, "tbili" meaning "warm" in Georgian. 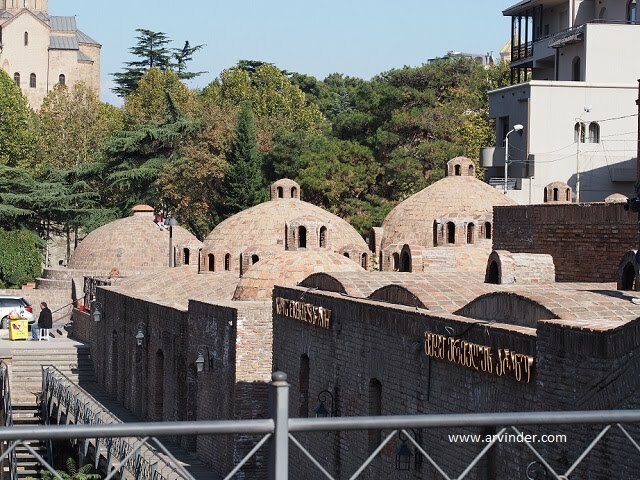 The hot springs are still in use today (they are arguably what gave Tbilisi its name). The hot springs is a place where one can enjoy in the sulfur water and get scrubbed. The bath houses above, picture I took while on my way down from visiting Mother Georgia statue, I took the Tram to get on top of the hill and on the way back I walked down, Great view from he hill. I didn't take a bath, the place smelled of sulfur. Food: My favorites, stuffed flatbread called khachapuri or simply put it Georgian Pizza. I had the stuffed with mushrooms, it was delicious. The shop was just outside the Holy Trinity Church, I sat outside enjoying the views and the stuffed beard. Travel Tip: Get a Tbilisi Metro Card, cost is 2 Lari, top it up with money as you go. 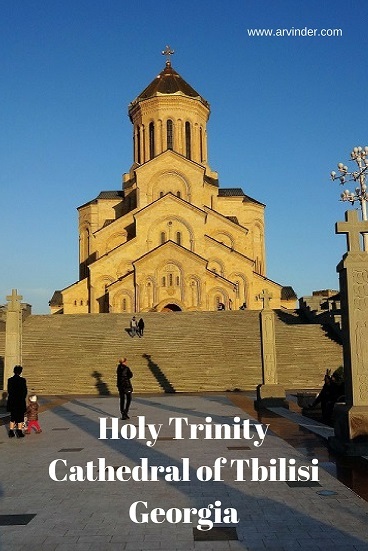 Tip #2, there is a sightseeing hop on hop off bus, the ticket is good for 24 hours, I spent all day exploring Tbilisi using the hop on hop off bus. 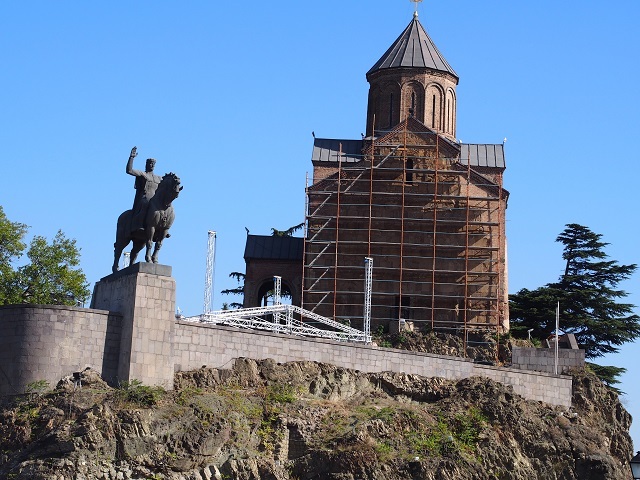 Tbilisi was founded by King Vakhtang Gorgasali during the 5th century. There is so much to write about Georgia and my travel there, I'll have to make time and write more, for now hope you liked this post. I'd never heard of this place before but those hot springs sound awesome. What a neat town. Thanks for posting this :) Our current World Vision child lives in Tbilisi. It looks beautiful!